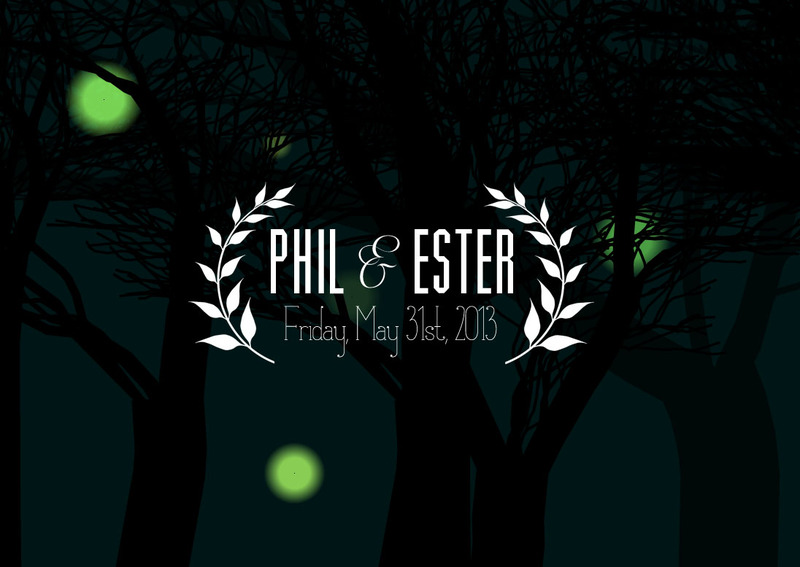 One of the projects I took on for our wedding was our official wedding website, I registered two domains, esterandphil.com as well as philandester.com thus avoiding any confusion. Both site pointed to the same page, for the general public a simple splash with a dynamic forest animation accomplished with the help of jQuery. We wanted to create a page that connected with our venue which was in a barn on a conservation area. I’ve always enjoyed sine path algorithms so I created a scene where silhouetted trees scroll slowly by in a parallax-esc fashion and fuzzy Will-o’-the-wisp dots float lazily upward on sine waves. Randomly the wisps will be replaced with rain and visiting the site during the day versus during the night will result in different colours and songs. The trees are selected randomly from one of six or seven images which then have a random amount of transparency and speed applied so that some seem further in the distance. Once they disappear off of one side they are recycled, animating in from the starting side again. Similarly the wisps have random factors applied to their size, speed, sine curve and alpha. The wisps are also interspersed on the z-axis to move in front of some trees while behind others adding to the illusion of depth. The wisps are also recycled once they’ve floated out of view. On the live site I adjust the parameters for some popular clients, such as iOS for which I disabled animation and reduced the number of trees and wisps. Inaccessible to the public is a guest site which used the splash page concept as a background with only the a couple of wisps animating with static trees (still randomly generated). While this exact example is probably not portable verbatim you may find the method libraries I used as well as the technique useful. I have outlined some of the initializer functions below and linked to the libraries, some of which I have modified. The final library, animate.js, is almost completely custom code for this site and thus would have to be altered to suit your needs.